Since returning to southern California, my outdoor lifestyle has increased tenfold. I couldn’t be happier to get back to nature and Athena is really loving time in the mountains, hiking, and playing at the parks. A good pair of hiking shoes is a must but choosing the right pair isn’t as easy. The brand wasn’t a question; I love my LOWAs. Actually, I love them so much that my previous pair is totally worn out. 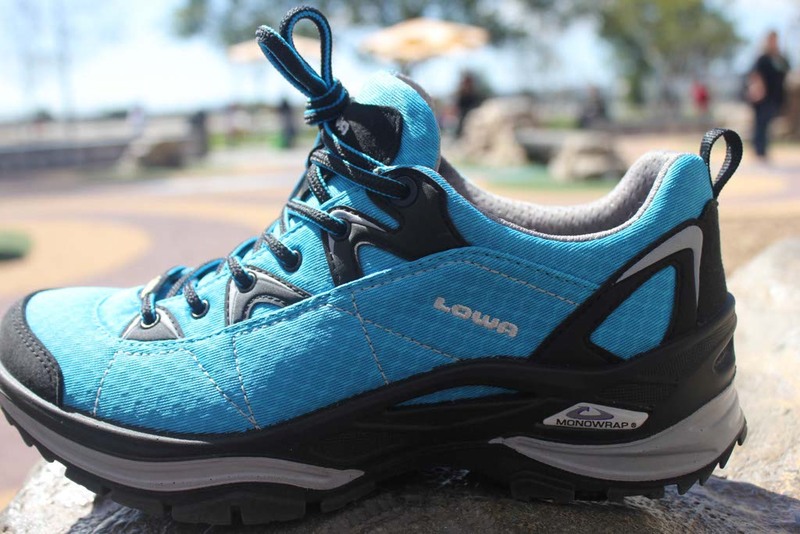 I wanted something similar to my S-Crown GTX Trail Running Shoes with GORE-TEX lining, waterproof, breathable, and flexible for an active lifestyle. After exploring tons of options on the LOWA site, I decided on the Ferrox GTX lightweight trail shoe. Why? They offered everything that I had in my S-Crown GTX runners and added a super stable trail platform with a new NXT sole unit that delivers exceptional stability and an ultra-comfy, cushioned ride. As a toddler’s mother, I could be doing anything from hiking trails to running around the playground to jumping in puddles, although I might be hard up to find a puddle in Laguna. My shoes need to be as versatile as my lifestyle; that’s why I continue to go with LOWA. Some shoes need to be broken in but not my LOWAs. They arrived yesterday and I tested them out in Laguna Canyon today. I hiked 4 miles up and down hills with Athena on my back and my feet still felt great. 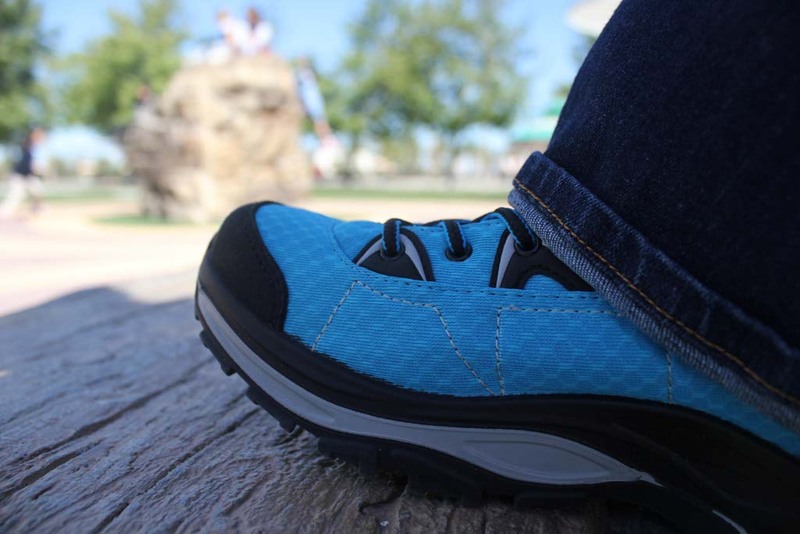 The soles are ideal, ensuring enough support to hike over rocky trails but comfortable enough to go long distances. Even in the heat of SoCal, they were breathable and remained cool. I figured the hike would have been enough adventure for Athena for the day, but not a chance. After her nap, she was ready to explore some more. We returned to the outdoors but chose the Great Park as our next destination. Kids Rock Playground is inspired by and focused around educating young guests about conservation ecology and the water cycle. A group of misting shade structures, climbing rocks, “underground tunnels,” a seating area made from recycled runway concrete, and illustrated lakes and streams on recycled rubber flooring, come together to form an educationally unique and environmentally conscious space that is safe and fun. It was the ideal platform to test out the “mommy durability” of my shoes. If I could slide, climb, jump, and maneuver my way through Kids Rock Playground after hiking Laguna Canyon, I’d know my new shoes were a great investment. They passed the test with flying colors. After an hour of play time, my feet were still feeling comfortable and dry. They were flexible enough to move comfortably yet never got too hot on my feet. The consistent temperatures and sunshine allow us to spend the better part of our day outdoors. From mountain hiking to playing in the park, I need to have a pair of shoes that let me do it all. 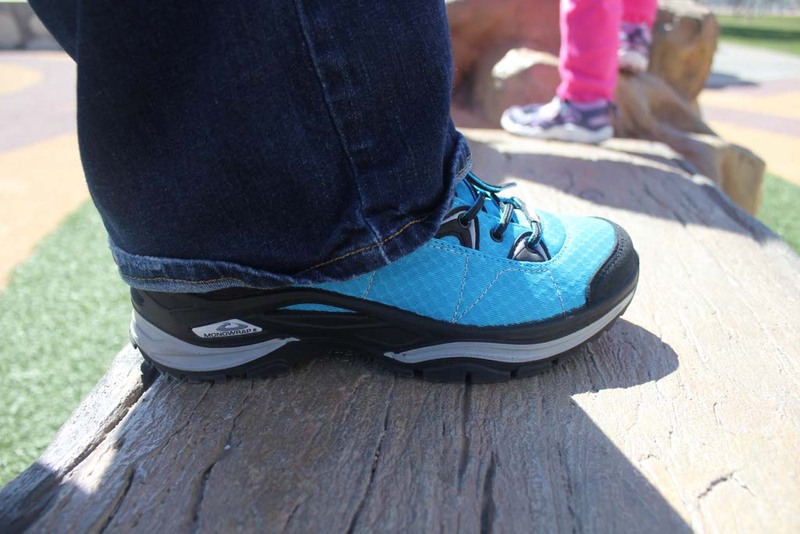 The Ferrox GTX lightweight trail shoe is Mommy approved. If only I could wear them in the water, I’d never take them off. I love the colour! I haven’t owned a pair of LOWA shoes but I did hear about them before. It’s time for a new pair of runners. I’m going to look at their site now. Maybe it’s time for a change. I love comfortable shoes & would invest in some like those if had money to get them. Am fairly happy for our weather in Colorado which has been a lot of rain throughout the spring, summer, fall & going into the winter now. They seem to be very well constructed. Where are they made at & what stores sell them? Do they have a website through a store that I can go to which gives all the details & tells the price also?